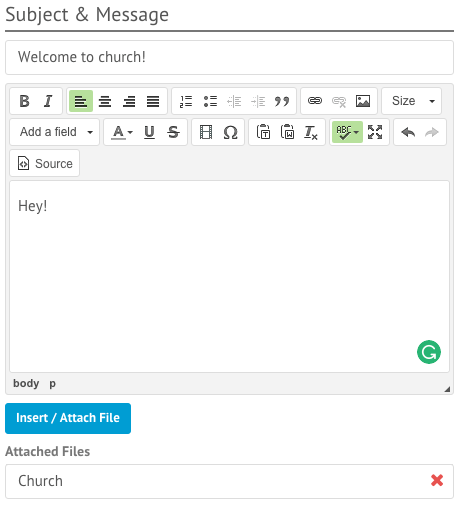 Inserting files into posts, pages or emails all follow the same approach. You can insert or attach an image or a document in a variety of methods, but for inserting or attaching a document, only the ‘Insert Link’ and ‘Attach File’ methods will work. Click on ‘Insert / Attach File’. Select the link of the file to be inserted or attached to the post, page or email. To include a new file, simply click on the ‘Upload File’ button. When this window appears, simply select the option you wish the image to appear as. 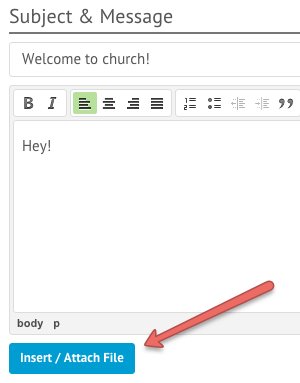 By selecting this option, a link will appear in the text editor. When the post has been published, users can download the file / image by clicking on the link. 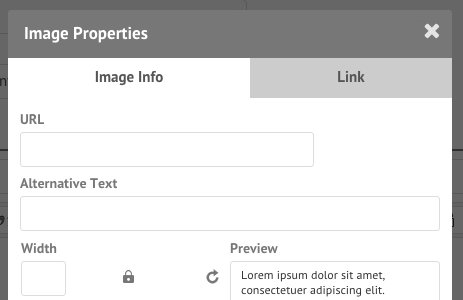 This option will only appear for images and allows you to embed the image into the text. When the post has been published, users can view the image within the text. Note: You will only be able to choose this in an email if there are no lockdown options applied to the image. If you have lockdowns applied, when the email is received, the user will be treated as a guest and will not be able to see the image. By selecting ‘Attach File’, the file will be added as an attachment located underneath the post, page or email. Please note, that if you use the ‘Upload file’ to attach a new file, it will be stored in your Files section, with no restrictions in place. There may be times when you want to use an image from an external website. To do this, simply click on the Image icon on the text editor. When this window appears, simply paste in the URL of the external image in the field indicated by the arrow. Note: we highly recommend you to link from a HTTPS version only of images or videos from the web. This will load any content over a secure connection and eliminate any possibility of warning messages showing up saying the page is loading insecure content.